Spain is a country that offers many holiday opportunities for disabled people and those with learning disabilities and if you’ve not visited before, be prepared to fall in love! Spain ranks as one of the top tourist destinations in the world and it’s easy to see why. The laid back Spanish lifestyle combined with sun soaked days and great cuisine makes for an enjoyable holiday whether you’re lazing by the beach or off sightseeing. Here on Disability Holidays Guide.com, we feature a range of accessible accommodation in Spain from wheelchair friendly resorts, villas, hotels, guesthouses and self-catering apartments where mobility aids are included or can be arranged. For those of you who are looking for all inclusive package deals and escorted group holidays, our featured tour operators and travel agents certainly know their stuff when it comes to disabled holidays in Spain and their ready to help plan your trip. If you’re in search of sun drenched beaches, Spain boasts five thousand miles of coastline. Head to any of the Costa’s on the mainland or for year round sun, the Canaries Islands will hit the spot. Many of the beaches in Spain are accessible with ramps leading to decking and if you require a beach wheelchair, enquire with your accommodation or the nearest tourist information centre. If you want to experience culture, art galleries, fascinating architecture and sample traditional Spanish dishes like paella and tapas, then the wonders of Barcelona, Madrid, Valencia and Alicante will not disappoint. Spain is also a playground for sports enthusiasts, and if you want to indulge in water sports, golf, riding or perhaps blokarting then our friends at Fundacion Handisport in Mallorca offer adapted equipment and courses suitable for disabled people, friends and family. 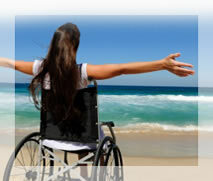 If that’s not enough to tempt you, scroll down to view this month’s hot offers and ideas for disabled holidays in Spain. If you are looking for home from home accommodation, let Estrella Lodge be the one! Situated on the outskirts of Javea, Costa Blanca, Spain, the Villa overlooks several Spanish villages and a beautiful valley. A great way to enjoy your holiday. We offer bed and breakfast, half board and full board options and whichever option you choose, water, tea and coffee are free and available at all times during your stay. We do also offer an exclusive option which includes breakfast, lunch and evening meal, airport transfers and transport to places of interest during your stay. A lovely detached villa situated in a quiet location overlooking orange groves. There are shops and restaurants (including a 'British' convenience store) within a 5 minute walk and it is just a 5 minute drive to the beach and 7 minutes to Guardamar, an unspoilt, 'typically Spanish' town with a delightful promenade and beautiful beaches. The villa is a 30 minute drive from Alicante airport and 40 minutes from Murcia (San Javier) airport. The villa was specifically designed to be wheelchair-friendly. All downstairs doorways are extra wide and there are ramps up to the front door. The downstairs shower is room-width to accommodate wheelchair access.